Take a trip to the amazing Assembly Square, developed to celebrate ten years of LEGO Modular Buildings, featuring a wealth of unsurpassed, intricate details and hidden surprises. Easy-to-remove building sections provide access to the highly detailed interior, comprising a ground level with a bakery, florists shop and caf, a middle level with a music store, photo studio and dental office, and an upper-level dance studio and apartment with access to a rooftop terrace with barbecue. The exterior of the building features a detailed sidewalk with outdoor caf furniture, fountain, streetlamps and a highly elaborate facade with beautifully detailed windows and doors, three buildable shop signs, spired tower and a decorative roofline. 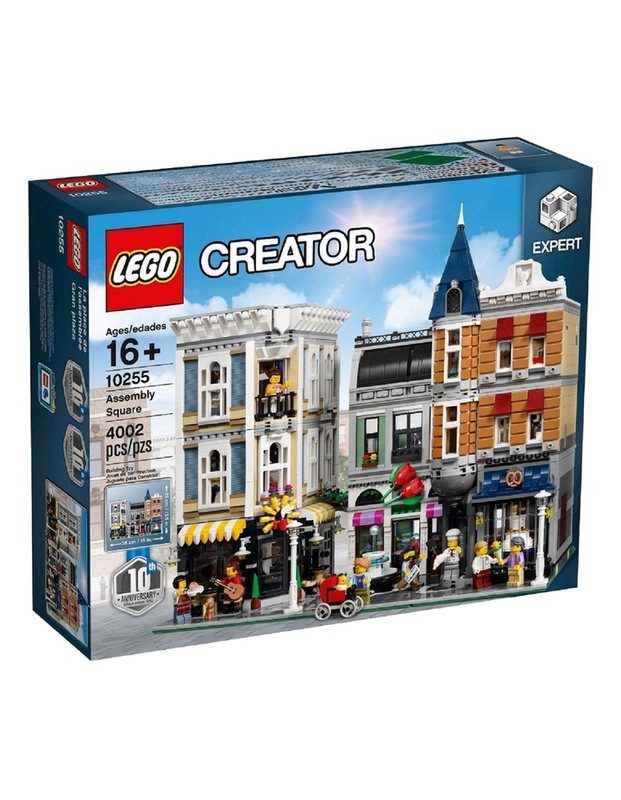 Collect and build an entire town with the LEGO Creator Expert Modular Building series 10243 Parisian Restaurant, 10246 Detectives Office and 10251 Brick Bank. Includes eight minifigures and a baby figure.